Gone are the days of the simple top freezer refrigerator models. Today, not only are their many styles to choose from, but they also come with a variety of options and features. Refrigerator styles range from the simple top or bottom freezer to more double-sided doors and expensive built-in models. Then there is the choice of materials: stainless steel, traditionally black or white, or even custom panels to match your kitchen. Newer refrigerators are also expanding features beyond just the water and ice dispenser in the door, offering multiple freezer sections and even high tech options like built-in digital picture frames and docking stations for electronics. So with all these options available, how can you pick a refrigerator that best suits your needs and preferences? 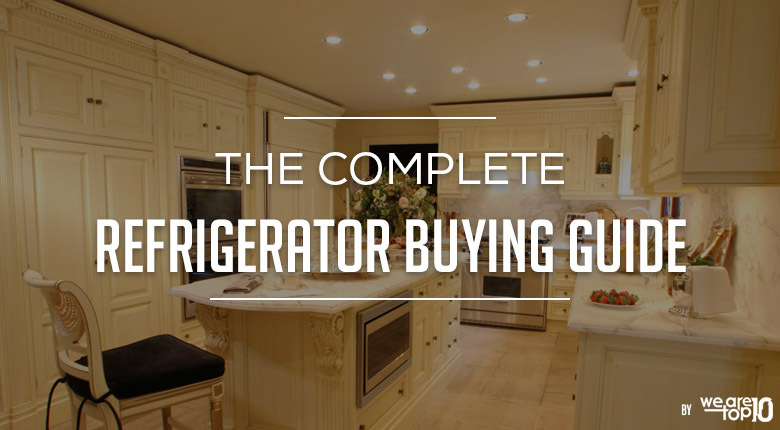 In this guide, we will help you choose the right refrigerator by breaking down various types of the refrigerator and things to consider when buying one. Firstly, it is important to consider the space the refrigerator will be in. Before heading off to the store to purchase your new refrigerator, you should measure the dimensions of the area that the refrigerator will sit in, allowing a few inches above and behind for air circulation. You will also want consider space for the doors to swing open, and if searching for a top or bottom freezer model you will need to decide which direction the door should open. Beyond just determining the space in which the refrigerator will be placed, you will also want to consider the size of the refrigerator itself. Refrigerators come in a variety of capacities measured by cubic feet, so you will want to choose one that best serves your needs. Most manufacturers recommend 19 to 22 cubic feet for a family of four or a minimum of 4 to 6 cubic feet per adult. Refrigerators come with a variety of storage configurations, so you will want to choose one that works best for you. Consider how you want the shelves and drawers to be arranged. You may want to look for one with adjustable glass shelves, which are easier to clean and can be customized to suit your needs. Pull out shelves or bins can also make it easier to access products. Some refrigerators now also come with door-in-door storage, making it is easier to access more frequently used items without having to open the entire door. This can help to save energy for those who want something more energy efficient refrigerators. You will need to consider what type of material you want your refrigerator to be as well. Stainless steel refrigerators are quite popular, but they also can easily show fingerprints and smudges. Manufacturers have come up with faux stainless steel finishes, which can help to control this problem. There is also the option for more expensive custom panels, which can be made to match your kitchen cabinetry, or you can always go with the more basic black or white colored model. Refrigerators now come with numerous built-in features. Some options to consider are a water and ice dispenser in the door which is quite common now, but these often require the most repair. Some other important features are temperature controls and freshness. The features that can help control the freshness of your food includes dual evaporators which can help maintain higher humidity levels in the refrigerator, while air purifiers can remove bacteria and mold spores. Additionally, vacuum-sealed drawers can help to keep your fruits and veggies fresher for a longer period. Temperature controls can also allow you to choose the temperature of your fridge in different storage compartments. This means if you want to pick a drawer to keep colder than the rest of the fridge for items like meat, you are able to. Since you will likely have your refrigerator for a long time, you will want to consider its energy efficiency. This will affect the long-term costs of running your refrigerator. Energy consumption can make a huge difference in the cost of operating your refrigerator over the course of its lifetime and buying an energy efficient refrigerator is a sensible choice for sure. There are many types of refrigerators to choose from, each with their own advantages and disadvantages. Below we will review different styles of refrigerators to choose from. If you are looking for a refrigerator that will give you plenty of storage space, then you may want to consider the Top Freezer models as these are the most traditional of them all and costs less too. They offer plenty of storage space and are good for tight spots where double-sided refrigerators won’t fit but get ready to crouch to reach lower shelves and drawers. This model is ideal for storage of large items especially cakes and pizzas. The freezer is at the top hence the name; it also has bins at the bottom of the refrigerator for vegetables and fruits. They can easily accommodate large items, such as birthday cakes and pizza boxes. Frozen foods are easily within reach. No need to bend down to reach your ice cream! Typically this type offers the most storage capacity. You need to bend down to reach items in the crisper bins. Not a good options for those who like to eat plenty of salads and veggies or for those who have a backache. If veggies and salads make your world tick, then this is the right choice of refrigerator you would want to stock as the refrigerator section is at your eye level and ideal for those who prefer to access things without bending down. This model provides the shelves at the top and the freezer at the bottom, and although it is spacious it is not as big as the top freezer model, it still has its own benefits. Your fridge shelves, which you use more, are at eye level. Fruits and veggies are right in view. Can accommodate larger items, much like the top freezer models. You have to bend down to find things in your freezer, which can be a challenge particularly for older people or those with disabilities. It has a bit less capacity than the typical top freezer models. This model takes design on a different level as compared to the basic top freezer and bottom freezer models and is ideal for offices small offices and for people who just want the right amount of fruits, cakes, and ice. It ensures easy access to freezer and the shelves compartments considering the freezer are on one side and the shelves on the other side and some models have a water dispenser built in so you don’t need to open the door every time you are thirsty. The design, however, is not as economical regarding efficiency as the top and bottom freezer models but it sure is very modern. This refrigerator combines the design of the bottom freezer model and the side to side model with its compartments having a small side to side doors. This design offers a larger storage space that the side to side model but falls short of the regular bottom freezer models. It is ideal for small kitchens, and its design is one of a kind. with the one with French doors being the most common in the market. They may not be the pocket-friendly type but still a worthwhile addition to your kitchen to store a large amount of pantry for foodies or big families. Expensive, especially if built in. Single Door vs. Double Door (Side-by-Side) Refrigerator, Which One is best? The best model will largely depend on your priorities when choosing a refrigerator. The side-by-side models are easier to access for children or people who are unable to bend down. Side-by-side models might also be best for small kitchens, where space is at a premium since doors do not swing open as widely. However, the benefits of space and accessibility can mean there will be some compromise in capacity and energy efficiency.Single door models offer more usable storage capacity than side-by-side models do. Also, these models tend to be a bit more energy efficient in comparison to the side-by-side model. Which Refrigerator is Best for Home? You will want to measure the dimensions of your kitchen space where the refrigerator will be placed. Refrigerators are designed to fit a range of sizes from 30” – 36” wide and 66” – 70” high. However, you will want to remember to include a 1” clearance around both sides and the top of the fridge. This will help to accommodate the hinge cap at the top, as well as to give the needed space for air circulation. If the refrigerator is going to be placed next to a sidewall, it is important to consider clearance for the door handle when it swings open. Next, you will want to consider the capacity you think you will need. 16 – 20 cubic feet is a good estimate for two people who cook a lot. Others recommend 19 – 22 cubic feet for a family of four. Consider that the stated capacity is not always all useable space, so open it up and check it out when you are shopping. Also, you might want to keep in mind what your food buying habits are. Do you shop in bulk? Do you use a lot of frozen meals? Do you order out a lot? All of these will play a factor in what kind of space you will need. You might need more freezer space if you use a lot of frozen meals or buy in bulk. You might need more fridge space if you eat a lot of fresh food. If you are ordering a lot of pizza, you might want to consider something to accommodate those larger boxes. What are some new and best features in refrigerators? Refrigerators have come a long way in what they offer consumers. Many today now include adjustable and sliding shelving, as well as spill safe glass shelves. These can help improve access to products, as well as make cleaning easier. They also offer more storage solutions, such as convertible drawers or multiple freezer compartments. Refrigerators can also include beverage compartments and wine racks. They also provide options and features that help to keep food fresh. Many feature fruit or vegetable crisper drawers, which had adjustable humidity settings. More models are starting to offer temperature-controlled compartments for meat and dairy products. Some are even capable of thawing and defrosting your food. Are freshness and temperature control features really that important? Freshness and temperature control can really help in prolonging the shelf life of your food. Settings for high and low humidity help to prolong the life of fruits and vegetables, while making temperatures colder can help to keep meat fresher for a longer amount of time. Which Refrigerator is Most Energy Efficient? Energy efficiency is a very important factor in choosing a refrigerator because they can use up to one-sixth of a home’s electricity. Environmental concerns aside, refrigerators can also be costly to run. The A+++ and A++ are rated as the best and most energy-efficient refrigerators. However, outside of this, there are a few rules of thumb to picking an energy efficient model. Side-by-side models tend to be the least energy efficient when compared to the top and bottom freezers. Also, you can choose features like door-in-door storage, which can help reduce energy consumption. We’ve written Mini Compact & Beverage Refrigerator Reviews to help you decide if you are not looking something from above.